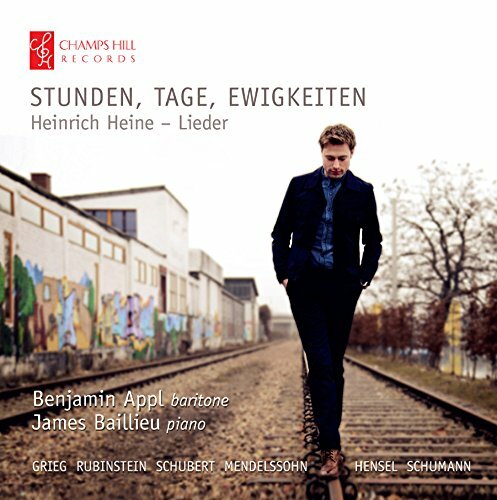 The German baritone Benjamin Appl, who recently signed to Sony Classical, has come up with a fascinating programme for his recital disc with James Baillieu on Champs Hill Records. Entitled Stunden, Tage, Ewigkeiten it is an exploration of the poet Heinrich Heine seen through settings of his poems by composers as diverse as Schumann, Schubert, Anton Rubenstein, Grieg, Felix Mendelssohn and Fanny Mendelssohn Hensel. Schumann's Dichterliebe and Schubert's Heine settings from Schwanengesang form the centrepieces, but there is also Rubenstein's Sechs Lieder von Heine, Op.32, Mendelssohn's Gruss Op.19a, No.5, Neue Liebe Op.19a, No.4 and Auf Flugeln des Gesanges Op.34, No.2, Fanny Mendelssohn Hensel's Scwhanenlied Op.1, No.1 and Warum sind deen die Rosen so blass Op.1, plus a couple of other Schumann settings, Belsazar Op.57 and Du bist wie eine Blume Op.25 No.24. 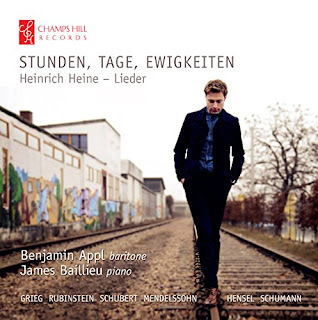 Benjamin Appl is very much a rising star of the lieder platform. Trained at the Guildhall School of Music and Drama, he was also Dietrich Fischer Dieskau's last private pupil, and is currently a BBC New Generation Artist. Appl cause quite a stir when he stood in at short notice at the Wigmore Hall with an all Schubert recital in January, with pianist Jonathan Ware (see Ruth Hansford's review on this blog). You can perhaps stretch the Fischer Dieskau link too much, but the way Appl combines his lyric baritone voice with a superb sense of the words does very much evoke his mentor. It is apt that it is a poet who links all the songs, as Appl's performances really bring out the text, not only is his diction superb but you are constantly aware of the words and their meaning colouring the music. Appl has a lovely warm baritone voice, with a firmly flexible sense of line and a burnished tone, but he doesn't coast along and he makes these songs the sung poetry that they were intended to be. We open with Edvard Grieg's Gruss, a lively and rather open-air setting which comes from Grieg's Op.48 set completed in 1888. This is followed by Anton Rubinstein's Sechs Lieder von Heine written in 1856 following the death of Schumann. There is very little that might be construed as Russian about these songs, and listening to them blind you might be forgiven for thinking they were by Mendelssohn. Beautifully constructed and nicely contrasted in tone, the songs benefit from the highly communicative performance from Benjamin Appl and James Baillieu. Der Asra is perhaps the best known of them, as Liszt did a piano transcription, and here the songs brings out Appl's fine story-telling abilities. The Heine settings from Schubert's Schwanengesang are simply song-writing on a different level. Appl and Baillieu give highly thoughtful performances of the four songs. Der Atlas starts with a vigorous piano, complementing Appl's virile voice, both bringing a fine sense of phrasing to the song. Ihr Bild is intense and quiet, interior and almost eerie with a sombre ending. Die Stadt opens with a highly evocative piano, and Appl sings the vocal line intensely quietly yet with a strong sense of interior drama, and this develops into something outwardly dramatic when he lets rip in the final two lines ('And shows me that place, Where I lost what I love most.'). Der Doppelganger starts quiet and barely there, which makes the slow controlled build during the song into something really thrilling. Mendelssohn's Gruss is a highly civilised song, beautifully made and beautifully performed, whilst his sister's Schwanenlied is lovely lyric melody which Appl sings with flowing, seductive tone. Mendelssohn's Neue Liebe is delightfully perky, with a sense of fairies in the piano accompaniment. Fanny's Warmum sing den die Rosen so blass is another song of great lyric beauty, perfectly performed. The final Mendelssohn song is Felix's well-known Auf Flugeln des Gesanges, and whilst Appl and Baillieu give due weight to the song's lyric beauty, Appl is also admirable in the way he brings out the words too. Schumann's Belsazar is one of his few long, stand-alone ballads. Appl and Baillieu perform it vividly, bringing out the story-line with a telling sense of detail. Du bist wei eine Blume comes from Schumann's Myrthen which dates from 1840 the same year as Dichterliebe (a year when Schumann composed over 150 songs include both Liederkreis collections and Frauenliebe und -Leben). Here is is given a very thoughtful, finely shaped performance. Schumann's Dichterliebe sets 16 Heine poems from Heine's Buch der Lieder, his 1827 publication which became popular with many composers. The songs have no narrative thread, but tell their own emotional story as the young poet reacts to emotional hurts. Appl's performance is perhaps not the most impulsive, his young man is thoughtful with a number of very interior moments yet the songs really do move through the emotions. The opening Im wunderschonen Monat Mai has superbly transparent piano playing which complements the sense of wonder in Appl's performance. Di Rose, die Lilie, die Taube, die Sonne is fast and light, but with vibrantly communicative words, and in Ich will meine Seele tauchen he has a lovely light touch in the upper register. Im Rhein, im heligen Strome finely virile from both performers, with a lovely change of tone for the middle verse. Ich grolle nicht benefits from expansive phrasing and a fine climax, whilst Das is ein Floten und Geigen combines a delicate waltz in the piano with strong irony from Appl. There is a lovely elegant swagger to Ein Jungling liebt ein Madchen, here and elsewhere the performers bring a lovely sense of youth to their performance. The translucent piano in Am leuchtenden Sommermorgen contributes to the haunted feel of the song, and Ich hab' im Traum geweinet is bleak and hesistant, conveying the intensity of the emotions. Whilst Allnachtlich im Traume is more upbeat, there is still a sense of hesitancy in the accompaniment. Aus alten Marchen winkt es starts brightly up tempo, but the swagger gradually disappears. The final song is robust yet grief-stricken, leaving it to the fabulous piano postlude to resolve things. There are fine performances on this disc from Appl and Baillieu, but there is also a wonderfully confident sense of programme making. The two clearly know how to put over these songs, yet also how to link them into a satisfying whole. Whilst there is a nice sense of youthful vigour in the performances, my overall impression was one of interior thoughtfulness. I look forward to Appl's future recitals with interest. Robert Schumann - Du bist wie eine Blume Op.25 No.24.